Paul Boultbee was born in Ontario and received his undergraduate and graduate degrees from the University of Western Ontario. In 1975 he left Canada to take up a position at the College of the Bahamas. In 1982 he arrived in Red Deer to take up a position at the Red Deer College Library. From July 1998 to June 2000, Paul assumed the responsibilities of Chairperson of Performing Arts. In September 2000 Paul entered Red Deer College’s Visual Arts program as a Bachelor of Fine Arts student, and graduated in 2003. He currently works out of his studio in downtown Red Deer, alleyscape studio. His work has been exhibited in Red Deer, Edmonton, and in several U.S. states. 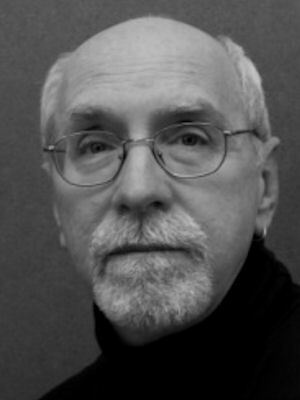 Paul’s stage credits include Under Milkwood (Huron Players); Wedding Band (University Players); two productions of HMS Pinafore; a variety of Central Alberta Theatre dinner theatres (Deathtrap, Absurd Person Singular, The Secretary Bird, The Mumberley Inheritance, A Shot in the Dark, Rough Crossing, and Beginnings), musicals (The King and I and Camelot), and stage productions (Relatively Speaking and The Lady’s Not for Burning). Other musical credits include Yeoman of the Guard, My Fair Lady, and Showboat. He has also appeared in Red Deer College’s Centre Stage productions of Dracula, You Can’t Take It With You, The Grapes of Wrath, A Christmas Carol, and the world premiere of the dada play. Professional credits include The Other Side of the Pole, The Wild Guys, and Adventures in Turning Forty (Prime Stock Theatre), Take A Risk Theatre’s inaugural production, The Goat, or Who is Sylvia, and Ignition Theatre’s Proof, Oleanna, Tuesdays with Morrie, Deathtrap, The Drawer Boy, Bug, and Corpus Christi. Paul has also appeared on stage with Red Deer College’s Conservatory of Ballet, the Red Deer Symphony Orchestra, People and Puppets Inc, and TogetherArt. He has received provincial awards for his performances in the one-act plays, Crux and Dr. Kheal. Paul’s film roles include Naked Frailties, Pizney’s Occupation, To The Victor, The Cabin, and Final Salutation as well as the award-winning short films Wait Time and Under the Acorn Tree.